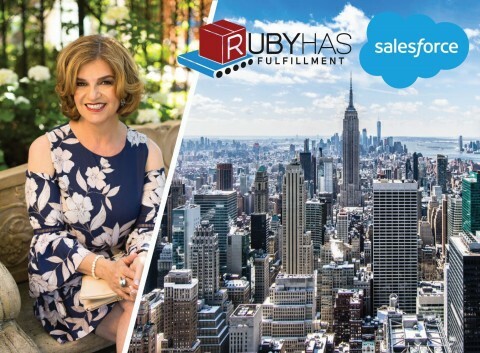 NEW YORK--(BUSINESS WIRE)--Salesforce has tapped Esther Kestenbaum, President and COO of Ruby Has Fulfillment, a leading, fast-growing ecommerce fulfillment company (Inc 5000, Crain’s Fast 50) to participate in its Women in Leadership Panel: Disrupt the World, Create Outstanding Opportunities, taking place on Wednesday, November 14th at the Salesforce Tower in New York City. Kestenbaum has been in SVP/CEO/COO roles in fast-growth environments with several exits, including both acquisitions and IPOs, and often acts as an advisor to early and mid-stage companies and their leadership teams. Salesforce Vice President, Aimee Frank, will be leading a panel of top female executives to drive discussion around topics including: Women in Careers - things you should think about, advocate, and develop; Building a Network - How to create a strong community, network, and find/be a mentor; and Being a True Woman Leader - How to build your own leaders and mentor your staff. Kestenbaum notes, “I’m humbled and delighted to be included by our forward-thinking partners at Salesforce to participate in a discussion on such a meaningful and timely topic. As a company, we have a majority of female employees, including top executives and throughout all levels within our business units. What’s more, we do so within the traditionally male-dominated field of transportation and logistics. I am thrilled to share my experiences about ways women can grow in their leadership capabilities." About Ruby Has Fulfillment: Ruby Has is one of the fastest growing ecommerce fulfillment providers (Ranked by Crain’s Fast 50 in 2018 and Inc. 5000 for three consecutive years) for direct-to-consumer brands and retailers, fulfilling their brand promises with precision, customization and excellence at scale. They are the dominant global fulfillment platform, providing an enterprise level end-to-end supply chain ecosystem to omni-channel brands regardless of size, customization or scale. Where others "break" and fail at scale, Ruby Has shines. Empower your brand and boost customer satisfaction with a full-service fulfillment provider that walks alongside your brand as a committed partner. Ruby Has Fulfillment leads the third-party logistics (3PL) industry with cutting-edge technology, seamless integration, and an uncompromising commitment to quality. Four warehouse locations across the US and Canada allow you to ship faster and reduce freight costs by up to 45% with bicoastal fulfillment solutions.